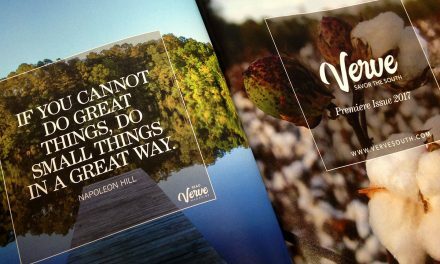 Welcome to Verve magazine, Mississippi’s freshest lifestyle magazine. To understand what Verve is about is to understand the very definition of the word. When we set out to create our magazine, we needed a name that represented the spirit and enthusiasm found in the people and culture that define our region. Luckily for us, there’s one word that does just that—Verve. From cover to cover, Verve magazine celebrates stories of the hard-working hands, creative minds, and compassionate hearts that embody the best of our unique Southern culture. Our pages provide engaging content and beautiful photography spanning subjects from travel, culture, and the arts, to food, health, and entertaining with some surprises in between. Each seasonal issue speaks to the spirit and soul of our diverse region with meaningful, fun, optimistic, and valuable information that will enrich and empower your life. Whether you have a head for business or a heart for home, an eye for design or the hands for healing, we hope to provide you with a timeless resource you may rely on for daily inspiration and enjoyment.